Publicado en: Uncategorized | Etiquetado: insects, philosophy, plants, poetry, QUANTUM PHYSICS! Beautifully written. Is that a hollyhock (with the grasshopper) from your garden? If so, could you save some of the seed pods for me? That is the exact deep, dark red shade I’ve been looking for and I love the multi-flora blossoms. Thanks! 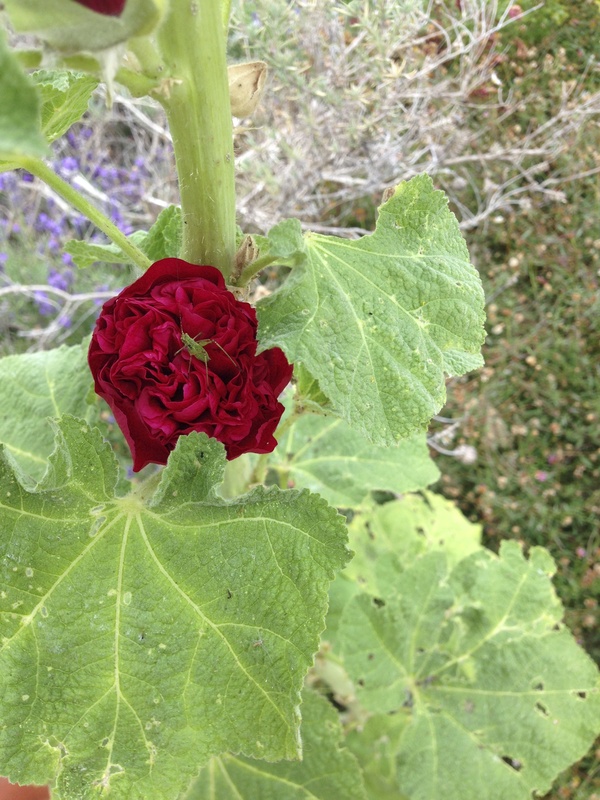 That picture is really old, and the hollyhock hasn’t fully regenerated yet. Right now, it’s a stump with some leaves. Sure, I’ll give you some when it seeds again! 🙂 The ‘grasshopper’ is actually a katydid who lived there for a few weeks. I used to visit him/her every day. I like that color, too. Yup! I love thinking about stuff like that. It’s also part of a quantum physics theory that I don’t quite get, but I’m sure it means something interesting! Oh well… someday I’ll figure it out! 😀 And thank you for the kind comment!